At Americarpet we have a wide selection of Commercial Laminate Flooring From Armstrong. These offer the look and feel of real hardwood for your commercial space with budget-friendly alternative. Whether the desired finish is reclaimed barn or traditional, the durable construction and great wear performance of a laminate floor make it a perfect solution for high traffic areas. 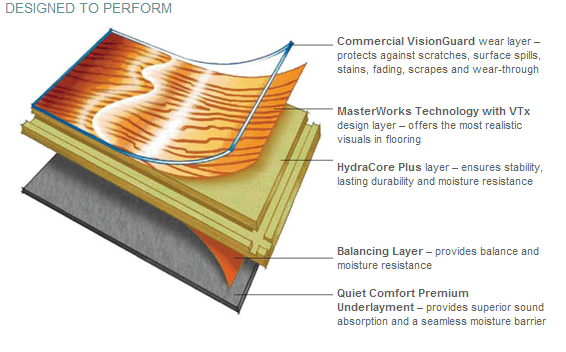 Armstongs embossing techniques, realistic edge designs, and line variations, to the lengths and widths of the flooring planks, Armstrong considers every aspect when developing laminate products to reflect the realism of natural hardwood flooring. Add texture and gloss and is more distinctive than any other laminate products on the market today. Thanks for such a wonderful description on laminate flooring. Apart from wood and marble, laminate flooring is also an important flooring choice. It's features and specifications are really amazing and attract customers and offer a perfect finishing touch.